A new study by researchers at UT Dallas’ Center for Vital Longevity, Duke University, and the University of Michigan has found that the strength of communication between the left and right hemispheres of the brain predicts performance on basic arithmetic problems. The findings shed light on the neural basis of human math abilities and suggest a possible route to aiding those who suffer from dyscalculia– an inability to understand and manipulate numbers. It has been known for some time that the parietal cortex, the top/middle region of the brain, plays a central role in so-called numerical cognition–our ability to process numerical information. Previous brain imaging studies have shown that the right parietal region is primarily involved in basic quantity processing (like gauging relative amounts of fruit in baskets), while the left parietal region is involved in more precise numerical operations like addition and subtraction. What has not been known is whether the two hemispheres can work together to improve math performance. The new study demonstrates that they can. The findings were recently published online in Cerebral Cortex. In the study, conducted in Dallas and led by Dr. Joonkoo Park, now a postdoctoral fellow at Duke University, researchers used functional magnetic resonance imaging, or fMRI, to measure the brain activity of 27 healthy young adults while they performed simple numerical and arithmetic tasks. 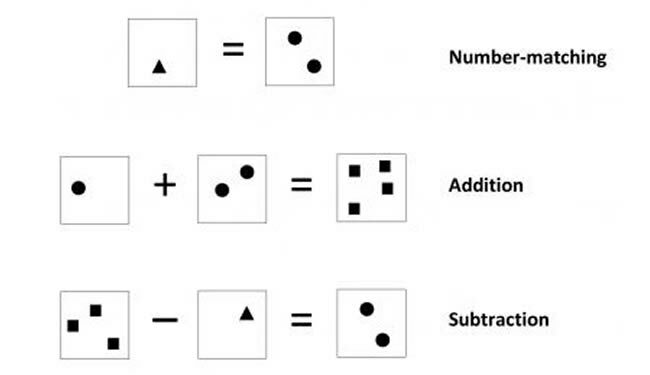 In one task, participants were asked to judge whether two groups of shapes contained the same or different numbers of items. In two other tasks, participants were asked to solve simple addition and subtraction problems. Consistent with previous studies, the researchers found that the basic number-matching task activated the right parietal cortex, while the addition and subtraction tasks produced additional activity in the left parietal cortex. But they also found something new: During the arithmetic tasks, communication between the left and right hemispheres increased significantly compared with the number-matching task. Moreover, people who exhibited the strongest connection between hemispheres were the fastest at solving the subtraction problems. “Our results suggest that subtraction performance is optimal when there is high coherence in the neural activity in these two brain regions. Two brain areas working together rather than either region alone appears to be key” said co-author Dr. Denise C. Park, co-director of the UT Dallas Center for Vital Longevity and Distinguished University Chair in the School of Behavioral and Brain Sciences. Park (no relation to the lead author) helped direct the study along with Dr. Thad Polk, professor of psychology at the University of Michigan. Such a training program might help develop math ability in children and could also help older adults whose arithmetic skills begin to falter as a normal part of age-related cognitive decline. This research was supported by a grant to Dr. Denise C. Park from the National Institute on Aging.